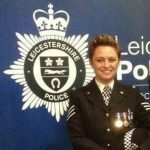 Emma Gilbert is a Detective Sergeant, currently serving with Leicestershire Police, with extensive experience of response, community and criminal investigation policing. She has specialised in child protection, youth offending interventions and the safeguarding of children and young people. In addition to these duties, Emma manages the UK’s innovative Police Link Officers for Deaf people (PLOD) scheme and manages a team of police officers and police staff trained at various levels of BSL and Deaf Awareness and which aims to make police services accessible to all D/deaf people. Emma is also an integral member of the DeafKidz International (DKI) charity which responds to the needs of deaf children and young people in low resource settings around the world. A vigorous champion for the rights of D/deaf people, Emma is working to introduce the concept of PLOD to all UK Police forces and, in partnership with DeafKidz International, policing agencies in South Africa, Kenya and Jamaica.